Polypoidal choroidal vasculopathy (PCV) is a retinal disorder commonly found in Asians presenting as neovascular age-related macular degeneration and is characterized by serous macular detachment, serous or hemorrhagic pigment epithelial detachment, subretinal hemorrhage, and occasionally visible orange-red subretinal nodular lesions. PCV is diagnosed using indocyanine green angiography (ICGA), and the lesions appear as polypoidal aneurysmal vascular lesions with or without abnormal branching vascular network. Although ICGA remains the gold standard for the diagnosis of PCV, various imaging modalities have also facilitated the diagnosis and monitoring of PCV. Recent advances in imaging technology including the use of high resolution spectral domain optical coherence tomography (OCT) and OCT angiography have provided new insights on the pathogenesis of PCV, suggesting a link between PCV and pachychoroid spectrum of macular disorders. With the evolving understanding on the pathogenesis and clinical characteristics of PCV, different therapeutic options have been proposed. These include intravitreal anti-vascular endothelial growth factor (anti-VEGF) monotherapy, combination therapy with anti-VEGF and verteporfin photodynamic therapy, and thermal laser photocoagulation. In recent years, major multi-center randomized clinical trials such as EVEREST, EVEREST II, and PLANET studies have been conducted to compare the efficacy and safety of various treatment options for PCV. This review aims to summarize the results of recent literature, clinical trials and studies to provide an update on the management options of PCV. An overall management strategy for PCV will also be proposed. Recently, there is an evolving understanding on the pathogenesis of PCV. PCV was originally described as an abnormality of the inner choroid, but subsequent studies have shown that PCV is a variant of type 1 choroidal neovascularization (CNV) occurring within or above the Bruch's membrane. Additional evidence have demonstrated choroidal thickening and increased choroidal hyperpermeability in eyes with PCV, suggesting a link between PCV and pachychoroid disorders including central serous chorioretinopathy and pachychoroid pigment epitheliopathy. The natural history of untreated PCV has shown variable outcomes, with half of the patients having a stable clinical course, and the other half having a significant deterioration in vision., Therefore, treatment of PCV is generally indicated in patients with symptomatic visual loss. Although anti-vascular endothelial growth factor (anti-VEGF) agents have been the mainstay of treatment in neovascular AMD, the optimal treatment guidelines of PCV have not been clearly established. In recent years, various major clinical trials have provided new evidence on different treatment modalities for PCV. This review aims to summarize the results of recent major clinical trials and studies to provide an update on the management options for PCV. Differentiating PCV from other macular diseases is essential to ensure appropriate treatment for the patients. Several diagnostic criteria have been proposed for the diagnosis of PCV. Two commonly adopted diagnostic criteria are according to the Japanese Study Group of PCV and the EVEREST Study Group.,, The Japanese Study Group of PCV defined definite PCV as having elevated orange-red subretinal polypoidal lesion on fundus examination, and/or polypoidal lesions on indocyanine green angiography (ICGA), and probable PCV is defined as only abnormal BVN seen on ICGA with or without recurrent hemorrhagic or serous PED, without features of definite PCV. With the need to conduct the EVEREST study, the first multicenter randomized clinical trial on PCV, the EVEREST Study Group developed diagnostic criteria for PCV where it was diagnosed depending on early subretinal ICGA hyperfluorescence (appearing within the first 5 min of dye injection) with at least one of the following criteria: nodular appearance of polyps when viewed stereoscopically, hypofluorescent halo around the nodule, pulsatile filling of polyps on dynamic ICGA, abnormal BVN, massive submacular hemorrhage, or orange subretinal nodules on color fundus photograph corresponding to hyperfluorescent area on ICGA., A study by Cheung et al. compared the use of a single “subretinal focal hyperfluorescence” sign on ICGA with a modified EVEREST study criteria in the diagnosis of PCV, and the latter was shown to have a higher specificity. PCV often presents as serous or hemorrhagic pigment epithelial detachment (PED) without or without subretinal hemorrhage [Figure 1] and [Figure 2]., PCV can be clinically classified into quiescent, exudative, or hemorrhagic types. In quiescent PCV, there is an absence of intraretinal fluid, subretinal fluid, or retinal or subretinal hemorrhage. Quiescent PCV is asymptomatic and is usually identified incidentally or in the fellow eye of PCV patients. Treatment for quiescent PCV is generally not required due to lack of exudative activity. Exudative PCV presents with exudation owing to leakage from active polyps and/or BVN but without hemorrhage and clinical features of exudative PCV can include serous PED, subretinal fluid, subretinal lipid exudation, and thickening of the neurosensory retina with intraretinal fluid. Hemorrhagic PCV is characterized by subretinal or sub-retinal pigment epithelium (RPE) hemorrhage with or without exudation. The hemorrhage can vary in size and can sometimes be massive covering the entire macula and can even result in breakthrough vitreous hemorrhage. The detection of polypoidal lesions on ICGA has been the gold standard for diagnosis of PCV. Both fundus camera-based and confocal scanning laser ophthalmoscope (cSLO) have been found to be useful in detecting nodular polyps in over 80% of eyes with PCV, with cSLO being more sensitive than the fundus camera-based system in the detection of BVN and late hyperfluorescent plaques. ICGA has also been shown to be useful in the evaluation of neovascular AMD patients who were poor responders to ranibizumab treatment and were subsequently diagnosed with having PCV in their revised diagnosis. Recent studies have proposed the use of ICGA in the classification of PCV and have classified PCV into 2 angiographic subtypes. Polypoidal CNV (type 1 PCV) is characterized by the presence of feeder and draining vessels on ICGA and is reported to show better visual improvement in response to anti-VEGF therapy but has poorer response to verteporfin photodynamic therapy (vPDT). Idiopathic PCV (type 2 PCV) is characterized by the absence of feeder vessels or draining vessels on ICGA and is reported to show better visual improvement in response to vPDT but has poorer response to anti-VEGF therapy., The distinct characteristics of these two subtypes may suggest differences in the underlying pathophysiology, disease prognosis, and the use of optimal treatment strategies. Because ICGA is a slightly invasive procedure with a potential to cause adverse reactions, studies have been evaluating the use of other non-invasive imaging modalities in diagnosing PCV including the use of optical coherence tomography (OCT). OCT provides high-resolution cross-sectional images of the retina and is useful in evaluating polypoidal lesions and BVN in PCV. Spectral domain OCT (SD-OCT) features of PCV include “double-layer sign” formed by two highly reflective layers consisting of RPE and Bruch's membrane, “thumb-like” protrusions caused by polyps, PED, and increased choroidal thickness [Figure 3]. [,,, SD-OCT has demonstrated to have a high sensitivity and specificity in differentiating between PCV and neovascular AMD. More recently, the use of SD-OCT in the enhanced depth imaging (EDI) mode as well as swept source OCT (SS-OCT) have also been shown to be useful in documenting the choroidal vascular changes and for evaluating choroidal thickness in patients with PCV., EDI SD-OCT and SS-OCT provided invaluable assessments in PCV as PCV is part of the pachychoroid spectrum of eye diseases demonstrating thickened choroid and pachyvessels have been shown to be significantly associated with PCV. Studies have also suggested increased number of hyper reflective foci on SD-OCT as a predictive factor for poorer visual outcomes following treatment for PCV. These hyper reflective spots are non-specific biomarkers caused by migration of intraretinal microglial cells representing on-going inflammation and are also seen in patients with other retinal vascular diseases including diabetic macular edema and retinal vein occlusion. OCT angiography (OCTA) is a relatively new non-invasive imaging tool that allows visualization of retinal and choroidal vasculature by detecting blood flow inside the vascular lumen through segmentation of images into different layers without the use of angiographic dye. Several studies have compared the applications of OCTA and ICGA in the detection of polyps and BVN and have demonstrated ICGA to be comparable or marginally superior to OCTA in the detection of BVN.,, Although polyps with cluster-like structures and flow signals within the polypoidal lesions could be detected on OCTA, the sensitivity of OCTA in detection of polyps was lower and the size of polyps measured was smaller compared to ICGA., A study by Inoue et al. also suggested that polyps were more clearly defined on cross-sectional OCTA images than en face images. Other studies have suggested the use of OCTA with other imaging modalities in the diagnosis of PCV. A study by Huang et al. demonstrated an increase in sensitivity in diagnosing PCV by 20% with OCTA following SD-OCT and FA, largely owing to the detection of BVN on OCTA. However, an improvement in specificity was not observed. Hence, OCTA is currently unable to replace ICGA as the gold standard diagnostic tool for PCV. PCV lesions commonly appear as an occult hyperfluorescence pattern on fluorescein angiography (FA), which might appear similar to CNV in neovascular AMD. Because FA is generally unable to visualize polyps located beneath the RPE layer, the role of FA in PCV diagnosis is rather limited. Nonetheless, FA is still useful for detecting secondary CNV that might be associated with PCV and to evaluate leakage or activity from the BVN. Fundus autofluorescence (FAF) is a non-invasive imaging technique that utilizes the detection of the natural fluorophore lipofuscin accumulating in RPE cells, which reflects the function of RPE. FAF abnormalities have been shown to be more common in patients with PCV than in patients with retinal angiomatous proliferation or typical neovascular AMD. Studies have demonstrated that PCV lesions show distinct FAF patterns. In a study by Yamagishi et al., polypoidal lesions were observed as having confluent hypoautofluorescence, and BVN as having granular hypoautofluorescence. Another study proposed 6 FAF patterns of polypoidal lesions and 2 FAF patterns of BVN. However, because FAF patterns in PCV are still inconsistent between studies, FAF patterns can only be used as an adjunctive tool at present in the diagnosis and monitoring of PCV. With our evolving understanding in the pathogenesis and features of PCV, the optimal treatment modality of PCV has been changing throughout the years. Currently, a number of treatment options are available for PCV, including thermal laser photocoagulation, vPDT monotherapy, anti-VEGF monotherapy (aflibercept, ranibizumab, conbercept, bevacizumab, and ziv-aflibercept), and combination therapy with anti-VEGF and vPDT. Prior to the availability of vPDT and anti-VEGF therapy, the use of thermal laser photocoagulation to ablate polyps on ICGA has been described in several studies with variable results, A study by Yuzawa et al. has demonstrated a decrease in visual acuity in 54% of patients, while another study by Lee et al. has shown stable or visual improvement in up to 75% of patients. Because laser photocoagulation can result in ocular complications including formation of chorioretinal scars, subretinal or sub-RPE hemorrhage, secondary CNV, and vitreous hemorrhage, it is generally only performed for polyps located far away from the fovea. Studies have also reported the effectiveness of adjunctive laser therapy and anti-VEGF therapy, which could improve visual outcomes. Prior to the availability of anti-VEGF agent, vPDT monotherapy was the standard of care for treatment of symptomatic macular PCV. The mechanism of action of vPDT in PCV is by the selective accumulation of the photosensitizer verteporfin in the CNV-like polypoidal lesions including the polyps and BVN and followed by activation of the photosensitizer to cause thrombosis and occlusion of the abnormal vessels. Multiple studies have demonstrated that vPDT monotherapy is effective in improving visual outcomes and inducing polyp regression in the short-term.,,,, However, despite successful complete regression of the polyps and exudative maculopathy, the BVN commonly persisted after vPDT treatment., A recent meta-analysis of 29 studies evaluated the 3-year outcomes of vPDT and studies generally reported visual improvement at 1-year and 2-year follow-ups. However, results were less favorable at the 3-year follow-up, with most studies reporting worsening of visual acuity especially in eyes with recurrence of lesions. In addition, complications such as subretinal hemorrhage, vitreous hemorrhage, and RPE rip might occur following vPDT for PCV., With the availability of anti-VEGF agents, the use of vPDT in PCV should always be performed in combination with an anti-VEGF agent unless there is a contraindication for anti-VEGF therapy. VEGF is one of the most important cytokines involved in angiogenesis and is implicated in the development of PCV. Elevated levels of VEGF have been found in the aqueous humor of eyes with PCV, though in lower levels compared with in neovascular AMD. Various clinical trials have demonstrated the efficacy of anti-VEGF agents in PCV, and it is currently one of the first line treatments for PCV. In a long-term study by Hikichi, anti-VEGF monotherapy has been shown to be effective in preserving vision of PCV patients after 6 years of follow-up. However, it was also recognized that continuous treatment was required to achieve these results, which is an important limitation in using anti-VEGF monotherapy. Ranibizumab (Lucentis/Accentrix, Novartis, Basel, Switzerland) is a VEGF antibody fragment that neutralizes all isoforms of VEGF-A, and its efficacy in PCV has been evaluated in a number of studies including the LAPTOP and EVEREST 1 and 2 studies.,,,,,,,,, The PEARL and PEARL2 studies have demonstrated the short-term efficacy of 0.5 mg and 2 mg ranibizumab in PCV, respectively. Monthly intravitreal ranibizumab was shown to stabilize vision, reduce subretinal hemorrhage, and decrease macular edema. At month 12, the studies reported polyp closure rates of 38% with 0.5 mg ranibizumab and 79% with 2.0 mg ranibizumab., The results were comparable to the 34.7% polyp regression rate with 0.5 mg ranibizumab observed in the latest EVEREST II study. However, BVN persisted in all PCV eyes in the PEARL and PEARL2 studies. The effect of ranibizumab on visual acuity was evaluated in the LAPTOP study, which was a phase IV, prospective, multi-centered randomized controlled trial that compared the efficacy of vPDT monotherapy versus intravitreal 0.5 mg ranibizumab with 3 monthly injections followed by a PRN regimen. At month 12, the proportion of patients who gained 0.2 logMAR units in the ranibizumab group was significantly higher than that in the vPDT group (30.4% vs. 17.0%; P = 0.039). However, the difference in change of central retinal thickness (CRT) was not statistically significant between the two groups. At month 24, ranibizumab monotherapy was also shown to be superior to vPDT monotherapy in visual acuity gain. The authors recently reported the 5 years outcomes of the LAPTOP study, and more than 70% of patients have been converted to aflibercept therapy during the follow-up. The observed superior visual acuity result in the initial ranibizumab group compared with vPDT group at 2 years was retained at 5 years. Studies have also evaluated the use conbercept (Lumitin, Chengdu Kang Hong Biotech, Chengdu, China) in the treatment of PCV. Conbercept is a fusion protein that inhibits VEGF-A, VEGF-B, and PlGF and is approved in China for the treatment of neovascular AMD. Phase 3 clinical trials in the use of conbercept for neovascular AMD is also being planned in the United States in the PANDA-1 and PANDA-2 trials (ClinicalTrials.gov Identifiers NCT03577899 and NCT03630952). The AURORA study was a 1-year, randomized, double-masked, controlled study that assessed the efficacy and safety of conbercept in neovascular AMD including PCV. Patients were randomized to receive 3 monthly injections of 0.5 mg or 2.0 mg conbercept followed by as-needed or monthly injections. Subgroup analysis of PCV patients showed both dosage groups had significant improvement in BCVA and anatomical outcomes, reducing CRT, regression of polyps, and BVN, and the two groups demonstrated no statistical difference in terms of improvement. A recent study by Huang et al. compared the efficacy of conbercept and ranibizumab. Both anti-VEGF agents showed similar improvement in BCVA and reduction in CRT at 6 months. However, complete polyp regression was found more frequently in the conbercept group compared to the ranibizumab group (47.7% vs. 28.6% respectively, P = 0.029), which may be important in terms of long-term treatment burden and prognosis of PCV patients. Nonetheless, studies with longer follow-up periods are yet to be conducted and are required to determine the long-term efficacy and safety of conbercept in PCV. Bevacizumab (Avastin, Roche, Basel, Switzerland) has been used as an off-label anti-VEGF agent in the treatment of PCV. Studies have demonstrated bevacizumab to be effective in improving visual acuity and reducing macular exudation. However, the rate of complete polyp regression reported was relatively low.,,,, For example, Gomi et al. showed that polyp resolution only occurred in 1 out of 11 eyes at 3 months following intravitreal bevacizumab injection. Nonetheless, because of the lower cost of bevacizumab, it remains a popular choice as an anti-VEGF agent for treating PCV and neovascular AMD in many countries. Ziv-aflibercept (Zaltrap, Sanofi, Paris, France) is an anti-VEGF agent approved for the treatment of metastatic colon cancer. Recently, studies have proposed the off-label use of ziv-aflibercept in the treatment of neovascular AMD including PCV. A report has demonstrated ziv-aflibercept to be effective in cases of PCV refractory to other anti-VEGF agents. A subsequent study has evaluated the 9-month efficacy and safety of ziv-aflibercept in the treatment of PCV, where improvement in BCVA and decrease in CRT were comparable to studies using other anti-VEGF monotherapy. Although the long-term efficacy of ziv-aflibercept is yet to be determined, its lower cost might make it a potential cost-effective treatment option in PCV. Several key clinical trials have been conducted and have demonstrated the favorable efficacy of combination therapy in PCV. The EVEREST study was the first ICGA-guided, randomized controlled trial that compared the efficacy of ranibizumab monotherapy, vPDT monotherapy, and combination therapy with ranibizumab and vPDT. The primary endpoint was complete polyp regression after 6 months assessed by ICGA. At 6 months, results demonstrated that combination therapy and vPDT monotherapy were superior to ranibizumab monotherapy. Complete polyp regression was observed in 77.8% of patients receiving combination therapy, in 71.4% of patients receiving vPDT monotherapy, and in 28.6% of patients receiving ranibizumab monotherapy (P < 0.001 compared with ranibizumab monotherapy group). Visual acuity gain was also observed in all 3 groups, but the differences between the groups were not statistically significant because of the small sample size of this pilot study. Therefore, subsequent large-scale EVEREST II and PLANET studies were conducted to demonstrate whether anti-VEGF therapy in combination vPDT could result in better treatment outcomes. The EVEREST II study was a multicenter, randomized controlled trial that compared the efficacy of ranibizumab with vPDT combination therapy and ranibizumab monotherapy. At month 12, combination therapy was non-inferior and superior to ranibizumab monotherapy in improving BCVA (8.3 vs. 5.1 letters; P = 0.01). Combination therapy was also superior to ranibizumab monotherapy in achieving complete polyp regression as assessed by ICGA (69.3% vs. 34.7%; P < 0.01). The mean number of injections required over 12 months was also lower in the combination arm, with 50.6% of patients in the combination arm and 26.2% of patients in the monotherapy arm requiring only 3 to 4 ranibizumab injections, hence, reducing the treatment burden. Combination therapy using anti-VEGF with initial or deferred vPDT has also been evaluated in other PCV trials. The FUJISAN study was a multicenter randomized controlled trial in Japan that compared the efficacy of intravitreal ranibizumab with initial or deferred vPDT in treatment-naïve PCV patients. Patients received with 3 loading doses of ranibizumab at monthly intervals with or without vPDT at baseline. Retreatment with vPDT is performed at month 3 assessment if ICGA demonstrated polypoidal lesions associated with subretinal fluid and the BCVA was 20/30 or below. At 12 months, both groups had similar BCVA improvement, polyp regression rate, and reduction in mean CRT. However, eyes which received ranibizumab with initial vPDT had fewer number of additional ranibizumab injections than those in the deferred vPDT group (1.5 vs. 3.8 injections, P < 0.001). The PLANET study was a randomized controlled trial that compared aflibercept monotherapy and aflibercept with rescue vPDT. Patients received 3 monthly aflibercept injections, followed by fixed dosing of aflibercept injections if the rescue criteria were not fulfilled, or monthly aflibercept injections with active or sham vPDT if rescue criteria were met. Results of the study at 1 year showed that aflibercept monotherapy was non-inferior to combination therapy, with similar gains in BCVA and anatomical improvement. However, because less than 15% of patients in both groups met the rescue criteria and received rescue treatment by week 52, the benefits of adding rescue vPDT could not be elucidated. The study suggested that aflibercept monotherapy could prevent most patients from deteriorating to a level that required rescue therapy. As mentioned previously, vPDT has been effective in stabilizing vision in PCV patients in the short-term, but complications after vPDT have also been reported, which may affect the final visual outcome., Recent studies have evaluated the vPDT regimen and have aimed to optimize the verteporfin dosage and laser fluence when used in combination therapy with anti-VEGF agents. Wong et al. compared half-dose versus standard-dose vPDT in combination with ranibizumab and showed that the visual outcomes of half-dose PDT were comparable to standard-dose vPDT at one year. However, half-dose vPDT was superior than standard-dose vPDT when baseline BCVA was 20/50 or better, or when there were three or less polyps on the baseline ICGA. Another study by Lee et al. also reported similar findings, with comparable visual outcomes in 2 groups, but half-dose PDT was shown to be less effective in inducing polyp regression. The provision of optimal treatment for PCV patients is largely dependent on the accurate diagnosis of PCV and differentiation of PCV from other macular diseases. ICGA remains the gold standard in the diagnosis of PCV, while SD-OCT is useful to determine the activity of PCV as shown by the presence of SRF, intraretinal fluid, and/or PED. In some occasions, the polypoidal lesions might not be visible at the initial clinical or ICGA assessments, and PCV is only diagnosed during the later course of the disease process. Therefore, in neovascular AMD cases non-responsive to anti-VEGF therapy, ICGA should be repeated to reassess the patients for a possible diagnosis of PCV. For symptomatic PCV with polyps and BVN located far away from the fovea, thermal laser photocoagulation can be considered. For symptomatic PCV with polypoidal lesions involving the juxtafoveal or subfoveal areas, anti-VEGF therapy with or without vPDT can be considered. The choice of treatment depends on the characteristics of PCV and patients' preferences, and the treatment responses can vary among individuals. Anti-VEGF monotherapy has been shown to be effective in improving BCVA, reducing leakage from BVN, and causing polyps regression, though the rates of polyp regression might vary between different anti-VEGF agents. The PLANET study showed that fixed dosing of aflibercept monotherapy is effective in improving the visual acuity of PCV patients with a small proportion of patients requiring rescue vPDT. Although serious ocular or systemic complications are rare following anti-VEGF monotherapy, frequent intravitreal injections may pose a large treatment burden to patients, especially in many Asian countries in which anti-VEGF agents are not financially reimbursed. Frequent intravitreal injections might also increase the potential risks associated with repeated injections. Another option of first-line treatment for PCV is to use combination vPDT and anti-VEGF therapy. Results of EVEREST II and FUJISAN studies have shown promising results in combination therapy using ranibizumab and vPDT, with improvement in BCVA, higher rates of complete polyp regression and reduction in the number of anti-VEGF injections required compared to ranibizumab monotherapy. PCV eyes with thicker subfoveal choroidal thickness might be less responsive to anti-VEGF monotherapy, and therefore, combination therapy using vPDT with anti-VEGF agents can be considered in these cases to reduce the treatment burden. However, in PCV eyes with large subretinal hemorrhage or choroidal thinning, anti-VEGF monotherapy should be considered as the first-line therapy. vPDT monotherapy is generally not recommended unless anti-VEGF therapy is contraindicated. After initial treatment, patients should be evaluated using SD-OCT, FA, and ICGA to determine the disease activity and to evaluate if the treatment regimen requires any modification. Because the recurrence rate of PCV is high with over 50% of patients developing recurrence after 18 months, patients should be monitored regularly and asked to seek ophthalmic care as soon as new symptoms arise. Dr. Lai has received honorarium for consultancy, lecture fee and grant support from Bayer and Novartis. Ciardella AP, Donsoff IM, Huang SJ, Costa DL, Yannuzzi LA. Polypoidal choroidal vasculopathy. Surv Ophthalmol 2004;49:25-37. Sho K, Takahashi K, Yamada H, Wada M, Nagai Y, Otsuji T, et al. Polypoidal choroidal vasculopathy: Incidence, demographic features, and clinical characteristics. Arch Ophthalmol 2003;121:1392-6. Wong C, Lee W, Ogura Y, Yeo I, Wong T, Cheung CMG. Age-related macular degeneration and polypoidal choroidal vasculopathy in Asians. Prog Retin Eye Res 2016;53:107-39. Laude A, Cackett PD, Vithana EN, Yeo IY, Wong D, Koh AH, et al. Polypoidal choroidal vasculopathy and neovascular age-related macular degeneration: Same or different disease? Prog Retin Eye Res 2010;29:19-29. Cheung CM, Laude A, Yeo I, Tan SP, Fan Q, Mathur R, et al. Systemic, ocular and genetic risk factors for age-related macular degeneration and polypoidal choroidal vasculopathy in Singaporeans. Sci Rep 2017;7:41386. Chen XL, Hu QR, Bai YJ, Deng Y, Wang HW, Liu S, et al. A comparison of risk factors for age-related macular degeneration and polypoidal choroidal vasculopathy in Chinese patients. Graefes Arch Clin Exp Ophthalmol 2018;256:1449-57. Fujiwara K, Yasuda M, Hata J, Oshima Y, Hashimoto S, Yoshitomi T, et al. Prevalence and risk factors for polypoidal choroidal vasculopathy in a general Japanese population: The Hisayama study. Semin Ophthalmol 2018 7:1-7. Liang XY, Chen LJ, Ng TK, Tuo J, Gao JL, Tam PO, et al. FPR1 interacts with CFH, HTRA1 and smoking in exudative age-related macular degeneration and polypoidal choroidal vasculopathy. Eye (Lond) 2014;28:1502-10. Ng TK, Liang XY, Lai TY, Ma L, Tam PO, Wang JX, et al. HTRA1 promoter variant differentiates polypoidal choroidal vasculopathy from exudative age-related macular degeneration. Sci Rep 2016;6:28639. Fan Q, Cheung CMG, Chen LJ, Yamashiro K, Ahn J, Laude A, et al. Shared genetic variants for polypoidal choroidal vasculopathy and typical neovascular age-related macular degeneration in East Asians. J Hum Genet 2017;62:1049-55. Yannuzzi L, Sorenson J, Spaide R, Lipson B. Idiopathic polypoidal choroidal vasculopathy (IPCV). Retina 1990;10:1-8. Khan S, Engelbert M, Imamura Y, Freund K. Polypoidal choroidal vasculopathy: Simultaneous indocyanine green angiography and eye-tracked spectral domain optical coherence tomography findings. Retina 2012;32:1057-68. Lee WK, Baek J, Dansingani KK, Lee JH, Freund KB. Choroidal morphology in eyes with polypoidal choroidal vasculopathy and normal or subnormal subfoveal choroidal thickness. Retina 2016;36 Suppl 1:S73-S82. Cheung CM, Yang E, Lee WK, Lee GK, Mathur R, Cheng J, et al. The natural history of polypoidal choroidal vasculopathy: A multi-center series of untreated Asian patients. Graefes Arch Clin Exp Ophthalmol 2015;253:2075-85. Uyama M, Wada M, Nagai Y, Matsubara T, Matsunaga H, Fukushima I, et al. Polypoidal choroidal vasculopathy: Natural history. Am J Ophthalmol 2002;133:639-48. Japanese Study Group of Polypoidal Choroidal Vasculopathy. [Criteria for diagnosis of polypoidal choroidal vasculopathy] [Article in Japanese]. Nippon Ganka Gakkai Zasshi 2005;109:417-27. Tan CS, Ngo W, Chen J, Tan NW, Lim T, EVEREST Group. EVEREST study report 2: Imaging and grading protocol, and baseline characteristics of a randomised controlled trial of polypoidal choroidal vasculopathy. Br J Ophthalmol 2015;99:624-8. Koh A, Lee W, Chen LJ, Chen SJ, Hashad Y, Kim H, et al. EVEREST study: Efficacy and safety of verteporfin photodynamic therapy in combination with ranibizumab or alone versus ranibizumab monotherapy in patients with symptomatic macular polypoidal choroidal vasculopathy. Retina 2012;32:1453-64. Cheung CM, Laude A, Wong W, Mathur R, Chan CM, Wong E, et al. Improved specificity of polypoidal choroidal vasculopathy diagnosis using a modified EVEREST criteria. Retina 2015;35:1375-80. Koh AH, Expert PCV Panel, Chen LJ, Chen SJ, Chen Y, Giridhar A, et al. Polypoidal choroidal vasculopathy: Evidence-based guidelines for clinical diagnosis and treatment. Retina 2013;33:686-716. Spaide RF, Yannuzzi LA, Slakter JS, Sorenson J, Orlach DA. Indocyanine green videoangiography of idiopathic polypoidal choroidal vasculopathy. Retina 1995;15:100-10. Cheung C, Lai TY, Chen SJ, Chong V, Lee W, Htoon H, et al. Understanding indocyanine green angiography in polypoidal choroidal vasculopathy: The group experience with digital fundus photography and confocal scanning laser ophthalmoscopy. Retina 2014;34:2397-406. Ozkaya A, Alagoz C, Garip R, Alkin Z, Perente I, Yazici AT, et al. The role of indocyanine green angiography imaging in further differential diagnosis of patients with nAMD who are morphologically poor responders to ranibizumab in a real-life setting. Eye 2016;30:958-65. Kawamura A, Yuzawa M, Mori R, Haruyama M, Tanaka K. Indocyanine green angiographic and optical coherence tomographic findings support classification of polypoidal choroidal vasculopathy into two types. Acta Ophthalmol 2013;91:e474-81. Jeong S, Sagong M. Short-term efficacy of intravitreal aflibercept depending on angiographic classification of polypoidal choroidal vasculopathy. Br J Ophthalmol 2017;101:758-63. Honda S, Miki A, Yanagisawa S, Matsumiya W, Nagai T, Tsukahara Y. Comparison of the outcomes of photodynamic therapy between two angiographic subtypes of polypoidal choroidal vasculopathy. Ophthalmologica 2014;232:92-6. Hope-Ross M, Yannuzzi L, Gragoudas ES, Guyer DR, Slakter JS, Sorenson J, et al. Adverse reactions due to indocyanine green. Ophthalmology 1994;101:529-33. Saito M, Iida T, Nagayama D. Cross-sectional and en face optical coherence tomographic features of polypoidal choroidal vasculopathy. Retina 2008;28:459-64. Yang LH, Jonas JB, Wei WB. Optical coherence tomographic enhanced depth imaging of polypoidal choroidal vasculopathy. Retina 2013;33:1584-9. Liu R, Li J, Li Z, Yu S, Yang Y, Yan H, et al. 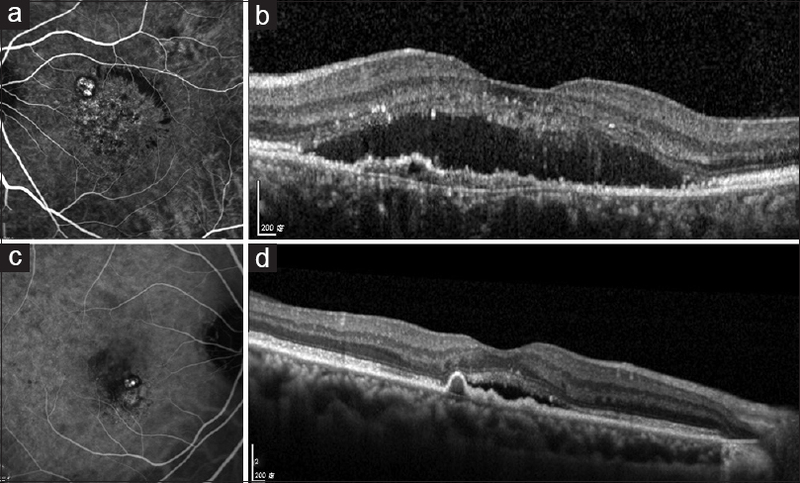 Distinguishing polypoidal choroidal vasculopathy from typical neovascular age-related macular degeneration based on spectral domain optical coherence tomography. Retina 2016;36:778-86. Semoun O, Coscas F, Coscas G, Lalloum F, Srour M, Souied EH. En face enhanced depth imaging optical coherence tomography of polypoidal choroidal vasculopathy. Br J Ophthalmol 2015;100:1028-34. Rishi P, Rishi E, Mathur G, Raval V. Ocular perfusion pressure and choroidal thickness in eyes with polypoidal choroidal vasculopathy, wet-age-related macular degeneration, and normals. Eye (Lond) 2013;27:1038-43. Ng DS, Bakthavatsalam M, Lai FH, Cheung CY, Cheung GC, Tang FY, et al. Classification of exudative age-related macular degeneration with pachyvessels on en face swept-source optical coherence tomography. Invest Ophthalmol Vis Sci 2017 1;58:1054-62. Lee H, Ji B, Chung H, Kim HC. Correlation between optical coherence tomographic hyperreflective foci and visual outcomes after anti-VEGF treatment in neovascular age-related macular degeneration and polypoidal choroidal vasculopathy. Retina 2016;36:465-75. Chatziralli IP, Sergentanis TN, Sivaprasad S. Hyperreflectie foci as an independent visual outcome predictor in macular edema due to retinal vascular diseases treated with intravitreal dexamethasone or ranibizumab. Retina 2016;36:2319-28. Spaide RF, Klancnik JM Jr, Cooney MJ. Retinal vascular layers imaged by fluorescein angiography and optical coherence tomography angiography. JAMA Ophthalmol 2015;133:45-50. Tomiyasu T, Nozaki M, Yoshida M, Ogura Y. Characteristics of polypoidal choroidal vasculopathy evaluated by optical coherence tomography angiography. Invest Ophthalmol Vis Sci 2016;57:324-30. Takayama K, Ito Y, Kaneko H, Kataoka K, Sugita T, Maruko R, et al. Comparison of indocyanine green angiography and optical coherence tomographic angiography in polypoidal choroidal vasculopathy. Eye 2016;31:45-52. Chan SY, Wang Q, Wang YX, Shi XH, Jonas JB, Wei WB. Polypoidal choroidal vasculopathy upon optical coherence tomographic angiography. Retina 2018;38:1187-94. Inoue M, Balaratnasingam C, Freund KB. Optical coherence tomography angiography of polypoidal choroidal vasculopathy and polypoidal choroidal neovascularization. Retina 2015;35:2265-74. Huang YM, Hsieh MH, Li AF, Chen SJ. Sensitivity, specificity, and limitations of optical coherence tomography angiography in diagnosis of polypoidal choroidal vasculopathy. J Ophthalmol 2017;2017:3479695. Gomi F, Sawa M, Mitarai K, Tsujikawa M, Tano Y. Angiographic lesion of polypoidal choroidal vasculopathy on indocyanine green and fluorescein angiography. Graefes Arch Clin Exp Ophthalmol 2007;245:1421-7. Ozkok A, Sigford DK, Tezel TH. Patterns of fundus autofluorescence defects in neovascular related macular degeneration subtypes. Retina 2016;36:2191-6. Yamagishi T, Koizumi H, Yamazaki T, Kinoshita S. Fundus autofluorescence in polypoidal choroidal vasculopathy. Ophthalmology 2012;119:1650-7. Zhao X, Xia S, Chen Y. Characteristic appearances of fundus autofluorescence in treatment-naive and active polypoidal choroidal vasculopathy: A retrospective study of 170 patients. Graefes Arch Clin Exp Ophthalmol 2018;256:1101-10. Lafaut BA, Leys AM, Snyers B, Rasquin F, De Laey JJ. Polypoidal choroidal vasculopathy in Caucasians. Graefes Arch Clin Exp Ophthalmol 2000;238:752-9. Kwok AK, Lai TY, Chan CW, Neoh EL, Lam DS. Polypoidal choroidal vasculopathy in Chinese patients. Br J Ophthalmol 2002;86:892-7. Yuzawa M, Mori R, Haruyama M. A study of laser photocoagulation for polypoidal choroidal vasculopathy. Jpn J Ophthalmol 2003;47:379-84. Lee MW, Yeo I, Wong D, Ang CL. Argon laser photocoagulation for the treatment of polypoidal choroidal vasculopathy. Eye (Lond).2009;23:145-8. Cheung CM, Yeo I, Li X, Mathur R, Lee SY, Chan CM, et al. Argon laser with and without anti-vascular endothelial growth factor therapy for extrafoveal polypoidal choroidal vasculopathy. Am J Ophthalmol 2013;155:295-304.e1. Chan WM, Lim TH, Pece A, Silva R, Yoshimura N. Verteporfin PDT for non-standard indications--a review of current literature. Graefes Arch Clin Exp Ophthalmol 2010;248:613-26. Spaide RF, Donsoff I, Lam DL, Yannuzzi LA, Jampol LM, Slakter J, et al. Treatment of polypoidal choroidal vasculopathy with photodynamic therapy. Retina 2002;22:529-35. Chan WM, Lam DS, Lai TY, Liu DT, Li KK, Yao Y, et al. Photodynamic therapy with verteporfin for symptomatic polypoidal choroidal vasculopathy: One-year results of a prospective case series. Ophthalmology 2004;111:1576-84. Lee SC, Seong YS, Kim SS, Koh HJ, Kwon OW. Photodynamic therapy with verteporfin for polypoidal choroidal vasculopathy of the macula. Ophthalmologica 2004;218:193-201. Silva RM, Figueira J, Cachulo ML, Duarte L, Faria de Abreu JR, Cunha-Vaz JG. Polypoidal choroidal vasculopathy and photodynamic therapy with verteporfin. Graefes Arch Clin Exp Ophthalmol 2005;243:973-9. Akaza E, Yuzawa M, Matsumoto Y, Kashiwakura S, Fujita K, Mori R. Role of photodynamic therapy in polypoidal choroidal vasculopathy. Jpn J Ophthalmol 2007;51:270-77. Wong CW, Cheung CM, Mathur R, Li X, Chan CM, Yeo I, et al. Three-year results of polypoidal choroidal vasculopathy treated with photodynamic therapy: Retrospective Study and Systematic Review. Retina 2015;35:1577-93. Hirami Y, Tsujikawa A, Otani A, Yodoi Y, Aikawa H, Mandai M, et al. Hemorrhagic complications after photodynamic therapy for polypoidal choroidal vasculopathy. Retina 2007;27:335-41. Rishi P, Rishi E, Sharma M, Maitray A, Bhende M, Gopal L, et al. Incidence, outcomes, and risk factors for hemorrhagic complications in eyes with polypoidal choroidal vasculopathy following photodynamic therapy in Indian subjects. Indian J Ophthalmol 2017;65:712-8. Tong JP, Chan WM, Liu DT, Lai TY, Choy KW, Pang CP, et al. Aqueous humor levels of vascular endothelial growth factor and pigment epithelium-derived factor in polypoidal choroidal vasculopathy and choroidal neovascularization. Am J Ophthalmol 2006;141:456-62. Hikichi T. Six-year outcomes of antivascular endothelial growth factor monotherapy for polypoidal choroidal vasculopathy. Br J Ophthalmol 2018;102:97-101. Ferrara N, Damico L, Shams N, Lowman H, Kim R. Development of ranibizumab, an anti-vascular endothelial growth factor antigen binding fragment, as therapy for neovascular age-related macular degeneration. Retina 2006;26:859-70. Lai TY, Lee GK, Luk FO, Lam DS. Intravitreal ranibizumab with or without photodynamic therapy for the treatment of symptomatic polypoidal choroidal vasculopathy. Retina 2011;31:1581-8. Inoue M, Arakawa A, Yamane S, Kadonosono K. Long-term outcome of intravitreal ranibizumab treatment, compared with photodynamic therapy, in patients with polypoidal choroidal vasculopathy. Eye (Lond) 2013;27:1013-20. Oishi A, Miyamoto N, Mandai M, Honda S, Matsuoka T, Oh H, et al. LAPTOP Study: A 24-Month Trial of verteporfin versus ranibizumab for polypoidal choroidal vasculopathy. Ophthalmology 2014;121:1151-2. Koh A, Lai TYY, Takahashi K, Wong TY, Chen LJ, Ruamviboonsuk P, et al. Efficacy and safety of ranibizumab with or without verteporfin photodynamic therapy for polypoidal choroidal vasculopathy: A randomized clinical trial. JAMA Ophthalmol 2017;135:1206-13. Pak KY, Park SW, Byon IS, Lee JE. Treat-and-extend regimen using ranibizumab for polypoidal choroidal vasculopathy. One-Year Results. Retina 2017;37:561-7. Kokame GT. Prospective evaluation of subretinal vessel location in polypoidal choroidal vasculopathy (PCV) and response of hemorrhagic and exudative PCV to high-dose antiangiogenic therapy (an American Ophthalmological Society thesis). Trans Am Ophthalmol Soc 2014;112:74-93. Kokame GT, Yeung L, Lai JC. Continuous anti-VEGF treatment with ranibizumab for polypoidal choroidal vasculopathy: 6-month results. Br J Ophthalmol 2010;94:297-301. Oishi A, Kojima H, Mandai M, Honda S, Matsuoka T, Oh H, et al. Comparison of the effect of ranibizumab and verteporfin for polypoidal choroidal vasculopathy: 12-Month LAPTOP study results. Am J Ophthalmol 2013;156:644-51.e1. Miyamoto N, Mandai M, Oishi A, Nakai S, Honda S, Hirashima T, et al. Long-term results of photodynamic therapy or ranibizumab for polypoidal choroidal vasculopathy in LAPTOP study. Br J Ophthalmol 2018.doi: 10.1136/bjophthalmol-2018-312419. Cho HJ, Kim KM, Kim HS, Han JI, Kim CG, Lee TG, et al. Intravitreal aflibercept and ranibizumab injections for polypoidal choroidal vasculopathy. Am J Ophthalmol 2016;165:1-6. Azuma K, Obata R, Nomura Y, Tan X, Takahashi H, Yanagi Y. Angiographic findings of ranibizumab-resistant polypoidal choroidal vasculopathy after switching to a treat-and-extend regimen with intravitreal aflibercept. Retina 2016;36:2158-65. Kawashima Y, Oishi A, Tsujikawa A, Yamashiro K, Miyake M, Ueda-Arakawa N, et al. Effects of aflibercept for ranibizumab-resistant neovascular age-related macular degeneration and polypoidal choroidal vasculopathy. Graefes Arch Clin Exp Ophthalmol 2015;253:1471-7. Lee JE, Shin JP, Kim HW, Chang W, Kim YC, Lee SJ, et al. Efficacy of fixed-dosing aflibercept for treating polypoidal choroidal vasculopathy: 1-year results of the VAULT study. Graefes Arch Clin Exp Ophthalmol 2017;255:493-502. Arakawa A, Inoue M, Sato S, Yamane S, Kadonosono K. Efficacy of intravitreal aflibercept injections for Japanese patients with polypoidal choroidal vasculopathy. Clin Ophthalmol 2017;11:797-802. Oishi A, Tsujikawa A, Yamashiro K, Ooto S, Tamura H, Nakanishi H, et al. One-Year result of aflibercept treatment on age-related macular degeneration and predictive factors for visual outcome. Am J Ophthalmol 2015;159:853-60.e1. Yamamoto A, Okada AA, Kano M, Koizumi H, Saito M, Maruko I, et al. One-Year results of intravitreal aflibercept for polypoidal choroidal vasculopathy. Ophthalmology 2015;122:1866-72. Maruyama-Inoue M, Sato S, Yamane S, Kadonosono K. Intravitreal injection of aflibercept in patients with polypoidal choroidal vasculopathy: A 3-year follow up. Retina 2017. doi: 10.1097/IAE.0000000000001818. Hosokawa M, Morizane Y, Hirano M, Kimura S, Kumase F, Shiode Y, et al. One-year outcomes of a treat-and-extend regimen of intravitreal aflibercept for polypoidal choroidal vasculopathy. Jpn J Ophthalmol 2017;61:150-8. Morimoto M, Matsumoto H, Mimura K, Akiyama H. Two-year results of a treat-and-extend regimen with aflibercept for polypoidal choroidal vasculopathy. Graefes Arch Clin Exp Ophthalmol 2017;255:1891-7. Sun X, Lu X. Profile of conbercept in the treatment of neovascular age-related macular degeneration. Drug Des Devel Ther 2015;9:2311-20. Qu J, Cheng Y, Li X, Yu L, Ke X, AURORA Study Group. Efficacy of intravitreal injection of conbercept in polypoidal choroidal vasculopathy: Subgroup analysis of the Aurora study. Retina 2016;36:926-37. Huang Z, Ding Q, Yan M, Lian H, Chen Z, Chen X, et al. Short-term efficacy of conbercept and ranibizumab for polypoidal choroidal vasculopathy. Retina 2018.doi: 10.1097/IAE.0000000000002035. Lai TY, Chan WM, Liu DT, Luk FO, Lam DS. Intravitreal bevacizumab (Avastin) with or without photodynamic therapy for the treatment of polypoidal choroidal vasculopathy. Br J Ophthalmol 2008;92:661-6. Cheng CK, Peng CH, Chang CK, Hu CC, Chen LJ. One-year outcomes of intravitreal bevacizumab (avastin) therapy for polypoidal choroidal vasculopathy. Retina 2011;846-56. Gomi F, Sawa M, Sakaguchi H, Tsujikawa M, Oshima Y, Kamei M, et al. Efficacy of intravitreal bevacizumab for polypoidal choroidal vasculopathy. Br J Ophthalmol 2008;92:70-3. Song JH, Byeon SH, Lee SC, Koh HJ, Kwon OW. Short-term safety and efficacy of a single intravitreal bevacizumab injection for the management of polypoidal choroidal vasculopathy. Ophthalmologica 2009;223:85-92. Tsujikawa A, Ooto S, Yamashiro K, Tamura H, Otani A, Yoshimura N. Treatment of polypoidal choroidal vasculopathy by intravitreal injection of bevacizumab. Jpn J Ophthalmol 2010;54:310-9. Singh SR, Dogra A, Steward M, Das T, Chhablani J. Intravitreal ziv-aflibercept: Clinical Effects and Econmic Impact. Asia Pac J Ophthalmol (Phila) 2017;6:561-8. Videkar C, Kapoor A, Chhablani J, Narayanan R. Ziv-aflibercept: A novel option for the treatment of polypoidal choroidal vasculopathy. BMJ Case Rep 2015;2015.doi: 10.1136/bcr-2015-212988. Chan EW, Eldeeb M, Govindhari V, Sarvaiya C, Banker A, Mansour A, et al. Treatment outcomes of ziv-aflibercept for treatment-naïve polypoidal choroidal vasculopathy. Acta Ophthalmol 2018;96:e258-9. Sato T, Kishi S, Matsumoto H, Mukai R. Combined photodynamic therapy with verteporfin and intravitreal bevacizumab for polypoidal choroidal vasculopathy. Am J Ophthalmol 2010;149:947-54.e1. Kim M, Kim K, Kim DG, Yu SY, Kwak HW. Two-year results of photodynamic therapy combined with intravitreal anti-vascular endothelial growth factor for polypoidal choroidal vasculopathy. Ophthalmologica 2011;226:205-13. Kang HM, Koh HJ, Lee CS, Lee SC. Combined photodynamic therapy with intravitreal bevacizumab injections for polypoidal choroidal vasculopathy: Long-term visual outcome. Am J Ophthalmol 2014;157:598-606.e1. Jain P, Anantharaman G, Gopalakrishnan M, Goyal A. Long-term efficacy and safety of verteporfin photodynamic therapy in combination with anti-vascular endothelial growth factor for polypoidal choroidal vasculopathy. Indian J Ophthalmol 2018;66:1119-27. Lowe J, Araujo J, Yang J, Reich M, Oldendorp A, Shiu V, et al. Ranibizumab inhibits multiple forms of biologically active vascular endothelial growth factor in vitro and in vivo. Exp Eye Res 2007;85:425-30. Gomi F, Oshima Y, Mori R, Kano M, Saito M, Yamashita A, et al. Initial versus delayed photodynamic therapy in combination with ranibizumab for treatment of polypoidal choroidal vasculopathy: The Fujisan Study. Retina 2015;35:1569-76. Lee W, Iida T, Ogura Y, Chen S-J, Wong T, Mitchell P, et al. Efficacy and safety of intravitreal aflibercept for polypoidal choroidal vasculopathy in the PLANET Study: A randomized clinical trial. JAMA Ophthalmol 2018;136:786-93. Wong IY, Shi X, Gangwani R, Iu LP, Fung N, Li Q, et al. One-year results of half- versus standard-dose photodynamic therapy combined with ranibizumab for polypoidal choroidal vasculopathy. Retina 2018;38:725-30. Lee JH, Lee WK. Half-dose photodynamic therapy combined with bevacizumab for polypoidal choroidal vasculopathy. Retina 2015;35:1561-8.